2017 - a year that certainly seems to have had its fair share of ups and downs for many folks, myself included. Throughout it all though we learn valuable lessons, grow stronger, and remember to remain grateful for the simple gift of life itself. I was fortunate enough to be a part of some really amazing projects again this year, such as working with Ed Burtynsky, one of my earliest idols and inspirations in photography; having my photo published in Reader's Digest Magazine; guest judging the British Columbia Magazine Photo Contest; and embarking on a number of trips to explore and document incredible wilderness areas across Vancouver Island and BC. Below is a collection featuring some of my personal favourite photos from 2017. As always, I'm looking forward to what new places and faces this next year has in store. I hope you'll join me on the adventure! TJ. *Prints available here. 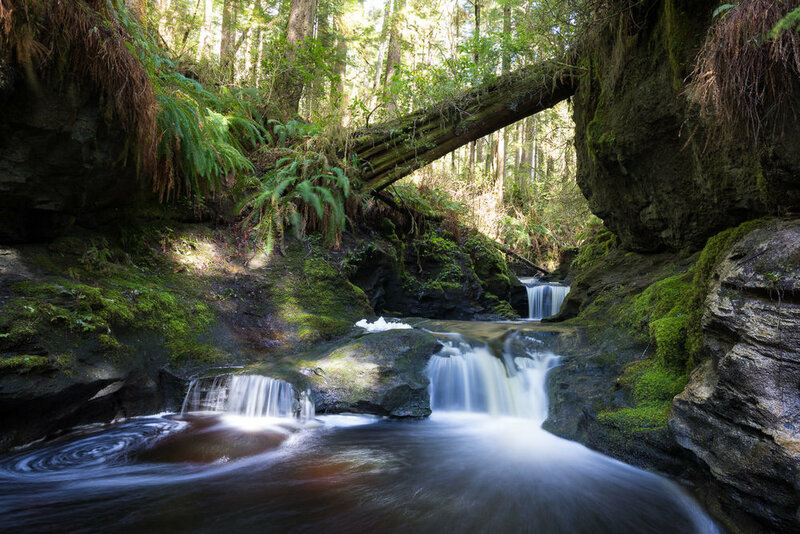 Nestled in a stunning stretch of old-growth forest along the Juan de Fuca Trail near Port Renfrew, a series of beautiful waterfalls flow through the sculpted sandstone walls of Payzant Creek. I amazed to see how the bubbles twirling in an eddy were captured in the photo as well. It's a truly magical place to visit and well worth the 6km round trip hike from the Parkinson Creek trailhead. The little bonsai tree at Fairy Lake near Port Renfrew is one of the most photographed trees around, so it can be hard to capture it in a new or unique way. On this particular day though, the water level was really high and a layer of mist hung over the lake's surface, making the tree (which grows on a log) appear as though it was growing straight out of the water. It was pretty surreal looking and resulted in one of my favourite photos yet. During a hike through the 'FernGully Grove' near Port Renfrew this winter, the sun was casting heavenly rays through the mist, illuminating the cool blue water and lush green ferns of the forest. It really is all about being in the right place at the right time, but that being said, much is still left up to luck. You can only be outside so much of the time and it always leaves me wondering what stunning sights must appear on a daily basis that only the mountains, trees, and wildlife will ever bear witness to. I've wished and waited my whole life to see the northern lights and this year, during a summer trip to Prince George, it finally happened. Along the drive into town, we were treated to a dazzling display of dancing green beams that made the whole sky appear to be alive and flowing with energy. By the time we arrived, the show had mellowed out a bit but I still managed to capture a few of the purple and green bands brushed like neon paint across the night sky. Early in 2017 I got hooked on photographing the beautiful Anna's hummingbirds living in our backyard. It was still winter and their colours stood out in shimmering contrast to the white snow. Since they move at incredible speeds, it was quite a challenge to capture a clear shot of one. But after spending many hours watching them, I began to notice some patterns as to where they would hover or perch on a branch. I set my camera up on a tripod underneath a make-shift blind and pre-focused the lens to the location I thought the birds would be. Then, using a remote live-view shooting feature on my new Canon 5D MKIV, I would trigger the camera from my phone at a distance. The plane of focus on the macro lens was razor thin so I was thrilled when I saw the bird's eyes and bright feathers were in focus. The little snowflakes falling around him topped it all off. 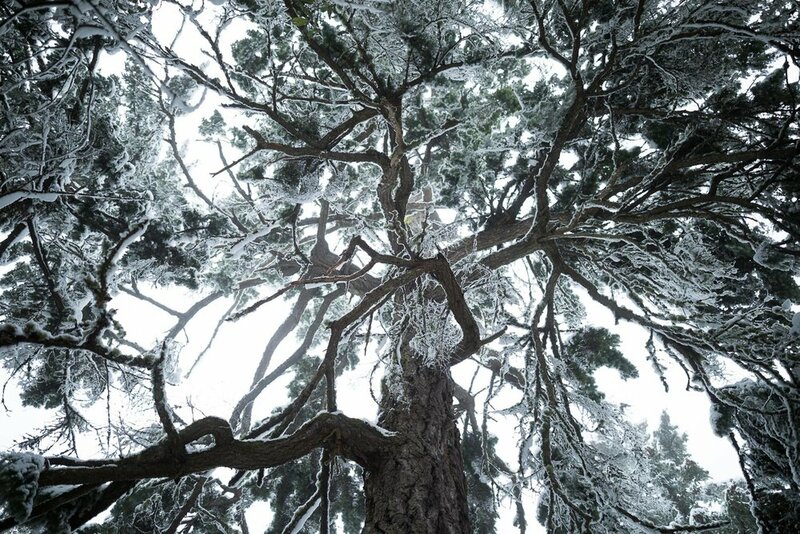 This image was taken one icy morning this winter in an old-growth clearcut near Port Renfrew. The fog floating through felt as though the ghosts of the former forest were hanging around the land they had been taken from. Part of the challenge in conservation photography, I feel, is to find beauty and form amidst the chaos and destruction. Compelling art and imagery works like a bridge, carrying difficult, yet important messages into the sphere of public consciousness. Especially in our digital age, visual communication plays an evermore important role in raising awareness of the many issues facing our planet - and hopefully compelling people to take action and help make a difference. While hiking along the edge of a recent old-growth clearcut near Port Renfrew, I was struck by the split view created by the trunk of a giant cedar tree. On the left, a window into a timeless grove of rare, valley bottom ancient forest. On the right, a scarred landscape, stripped of its once-grand flora and fauna. In the middle, an ancient tree - half its roots planted in a peaceful world it has known for centuries, the other on the edge of the ever-encroaching industrial world. 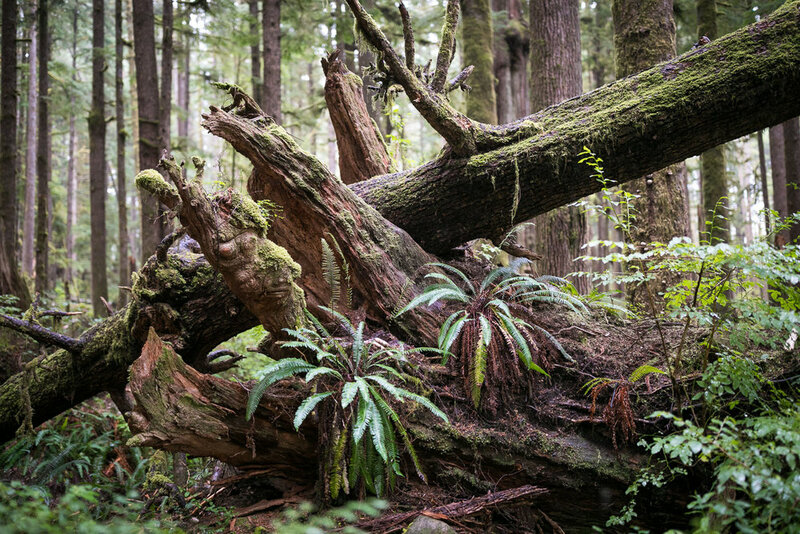 With less than 10% of our valley bottom old-growth forests left on Vancouver Island, which world will prevail? While walking along Botanical Beach in Port Renfrew, this beautiful amber-coloured kelp (Costaria costata) caught my eye. The patterns were mesmerizing and, when held up to the sun, it lit up like a work of stained glass art. I love the color amber and it was nice to create something a bit more abstract than my usual work. The estuary of San Juan River is one of my very favourite places to visit and to photograph. Whether it's the changing tides, seasons, or just time of day, there always seems to be a new and beautiful angle with which to view it. On this particular winter day, the sun broke out and caused the meadow to steam. The small trees adorned with white lichens only added to the mystical feel. Smoke from the wildfires that raged through BC's interior made its way over to Vancouver Island as well this summer. Seen here is the view of sunset from one of my favourite lookouts in Metchosin, Mt Helmcken, at the top of Neild Rd. 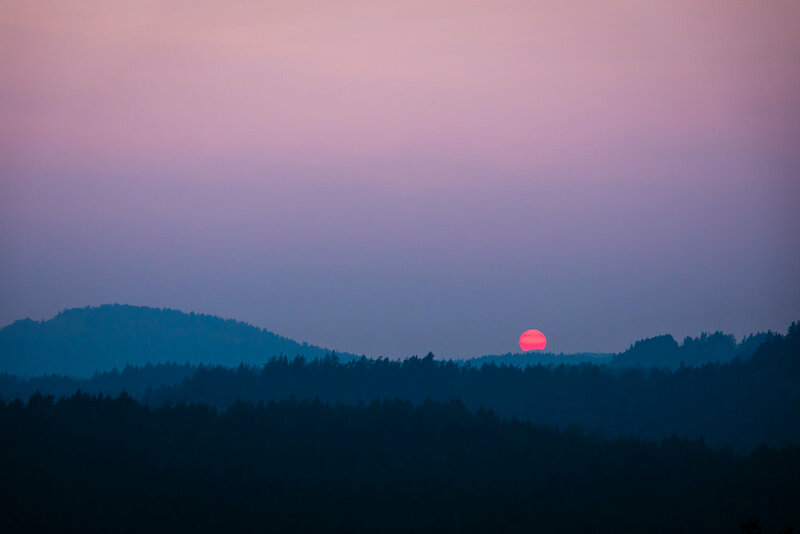 The pastel haze created a painterly (albeit ominous) feel across the sky and the rolling landscape of the Sooke Hills. During this year's solar eclipse, a kind fellow let me connect my camera to his telescope during the peak moment of transit (about 90% when viewed from Victoria). It was a fairly surreal experience seeing the daylight dim down but truthfully, I'm still pretty jealous of those who got to experience totality. Next time! The style and character of old, weathered Douglas-fir trees is a wonder to behold. There is something so zen-like about the shapes and patterns they take on - like the trees you see in Japanese paintings, shrouded in mist. I came upon this particular Doug-fir during a snowy walk up Mill Hill near Shawnigan Lake. It's amazing what magical moments can be found right in your own backyard. Slowly evolving over the course of millennia, our ancient forests form a beautiful organic tapestry, woven from the many cycles of life and death. Mother nature truly is the world's greatest artist and this nurse log seen here at the Avatar Grove is one my favourite's of her work. The true magnificence BC's coastal old-growth forest is something that needs to be experienced in person - that humbling feeling of being dwarfed by monumental trees, while the fog floats through the forest and quiet solitude surrounds you. I feel this image though, from the slopes of Edinburgh Mt near Port Renfrew, conveys some sense of the timeless beauty that can be found here. The Ancient Forest Alliance embarked on a trip this summer to visit part of BC's Inland Temperate Rainforest near the towns of Prince George and McBride. An area in particular, the Parthenon Grove, was one of the most stunning forests any of us had ever seen. The grove was filled with dense stands of old-growth redcedar trees adorned with golden lichens, giving the forest a fairy tale-like feel. Incredible places like these continually inspire me do everything I can do to help protect our amazing ancient forests...forever.